Conservation is so important to preserve needlework heirlooms. Most tissue papers contain acids that can weaken cloth and fibers causing them to become brittle and eventually deteriorate. This museum quality Acid-Free tissue paper will protect real metal threads, silk threads, needlework projects, valuable fabrics, memorabilia and family heirlooms. Available in 20" x 30" sheets. 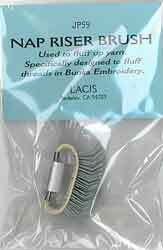 Place a drop of this liquid on thread ends to prevent raveling. Use for intricate gold work projects. Extra fine point provides pin point accuracy. 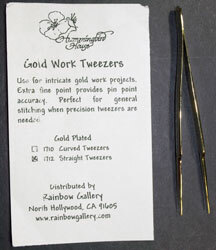 Perfect for general stitching when precision tweezers are needed. 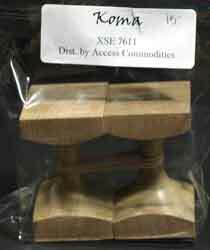 These beautiful wooden spools have square ends so that they stay put wherever they are placed. Wrap them with couchable threads, then place the spool close to your stitching and begin to couch the thread. 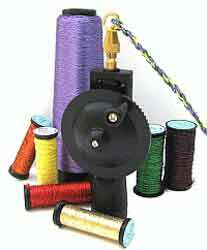 The spool will maintain thread tension and keep the thread steady as you couch. These 5.5" tweezers include a 4X magnifier and an LED bulb rated to last 100,000 hours. This little metal tine brush is great for creating a fuzzy effect. 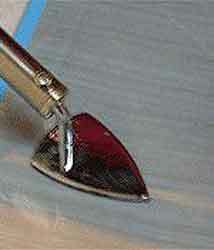 To use, gently brush over a stitched area. It is very effective with furry threads like Rainbow Angora. 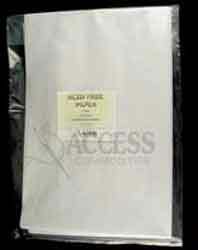 Quantity: Teflon Press Cloth - 3" X 4"
Teflon press cloth for use with iron-on threads. Quantity: Teflon Press Cloth - 9" X 12"
Tip heats instantly with the push of a button. Trims, burns, or melts thread with one touch…no more frayed thread ends. Extra-fine tip allows for precision application. Battery operated (one AA, not included). This easy-to-use tool can transform all kinds of threads into decorative twisted cords. Make professional looking trims for pillows, tassels, ornaments and more.